Studios with a kitchenette, some of which with a romantic touch, that can host up to 3 people. They are surrounded by beautiful gardens, where you can also find a swimming pool. The studios are located in Perissa, a short walk from the beach. 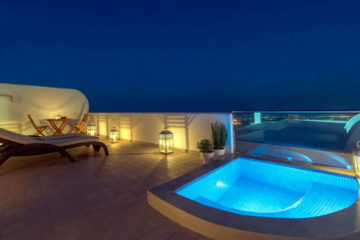 Specify the dates of your visit to Santorini to check availability and prices of Evizorzia Villas.